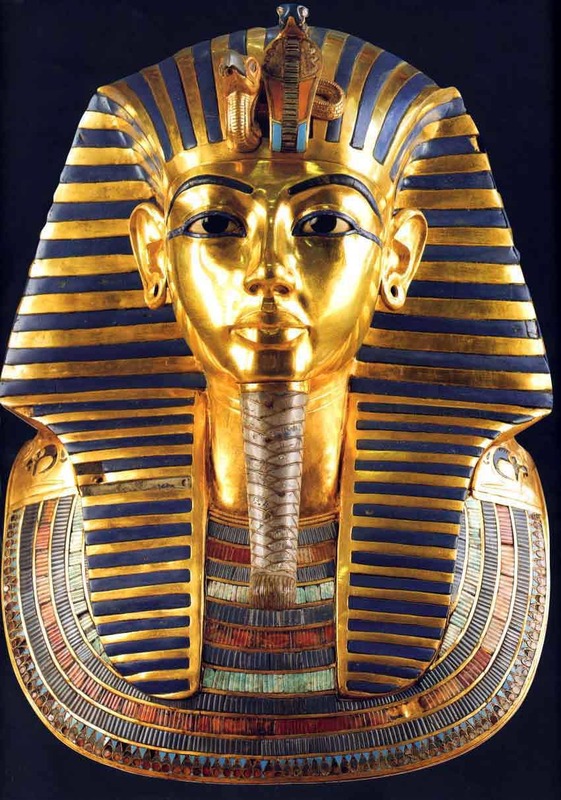 Boy-king Tutankhamen of ancient Egypt was enshrined in three gold coffins. The third and final coffin was made of 243 pounds (110 kilograms) of solid gold. Inside, his finery continued with this gold mask inlaid with lapis lazuli and colored glass. Admiration of gold predates history. The earliest known history of gold is of a golden treasure dating c. 4600 BC. One of the earliest known Egyptian maps, the Turin Papyrus Map, shows detailed plans for a gold mine. 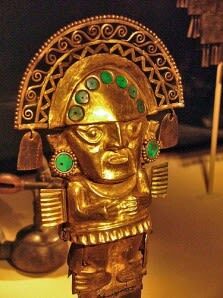 The Aztecs regarded gold as the product of the gods, calling it literally “gods excrement”. Civilizations from every corner of the world clearly made great connections with their gods and gold. Today the world is full of gold symbolism: ‘golden years’, ‘good as gold’, ‘golden rule’, ‘golden age ‘ and ‘gold standard’. Put simply, gold symbolizes greatness throughout all human history. 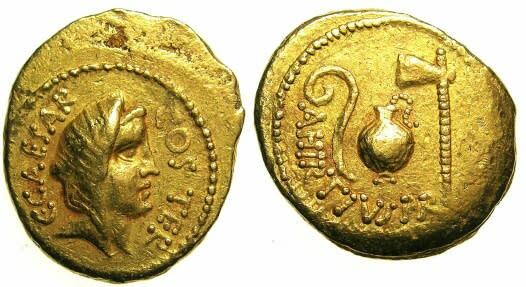 Lydia struck the first gold coins around 600 B.C. The coins were stamped of a gold and silver mixture known as electrum. A standardized money system undoubtedly helped in the success of Lydia. Around this time Greece consisted of more than two thousand city-states, most of which eventually issued their own coins. Coins usually had a portrait of their patron god or goddess on one side and a symbol of the city on the other. There were also often inscriptions, usually the name of the issuing city. Traders spread these coins across a vast area including Egypt, Afghanistan and India. Soon after, those kingdoms began to produce their own coins. Eventually the issuing coins with portraits of living kings came to practice. The use of commemorative coins to celebrate a victory or achievement also became prevalent. In an age without newspapers, it was an ideal way to convey a political message. Such coins are still being discovered today. Ancient coins are within the reach of even ordinary collectors. Ancient Roman coin under the rule of Julius Caesar. Mint of Rome, struck by A. Hirtius, 46 BC. Obverse: Veiled head facing right. Reverse: Lituus, jug and axe. Coinage was later established by the Roman government c. 300 B.C. Roman adoption of coinage was most likely cultural. Rome had no pressing economic need, but they wanted to emulate Greek culture. Coins had a silver content of 95%-98% by decree of Caesar Augustus in 15 B.C, but these coins endured much change in composition over time. The persistent change was inflationary debasement. Rome choose debasement of coinage in the face of government overspending. As time progressed, trade deficit with other countries grew larger. The import of grains and other commodities led to a currency drainage from Rome. The silver content of a Roman denarius fell to only 2% by the time the Roman Empire ultimately fell. The Spanish conquistadors had little concern for ornaments they found in South America. As a tragic result, much of the gold was melted down. Some treasures are still excavated from ancient graves even today, to give us a glimpse of the way it was. Christopher Columbus’ discovery of America in 1492 sparked an unprecedented wave of exploration. The Spaniards were pioneers of exploration in the New World, particularly South America. During this time Spaniards were deeply religious. Their objective was to spread Christianity among the inhabitants of the Americas. Such the endeavor was costly indeed. From their earliest interactions with Caribbean inhabitants, they knew that gold large quantities of gold existed, especially in the mainland. King Ferdinand instructed New World colonists to get gold first humanely, and if not, at all hazards. First the Caribbean islands, Cuba and Puerto Rico were targeted. The gold was taken away from the islands at a rate of about 1 ton per year for nearly 30 years before the resource was exhausted. A new flow of precious metals from the American mainland began around this time. Hernando Cortez conquered the Aztecs of Mexico and King Montezuma freely gave the emperor’s treasure to the conquistadors. The richest of all American civilizations, the Incas, lead by King Atahualpa, was the last known gold horde to be stolen. King Atahualpa was ultimately captured, and in an effort to secure his release, promised to completely fill his jail cell with gold. This ransom was paid with over 6 tons of gold and 13 tons of silver, but still, the king was killed. The Spaniards thirst for gold drove them through dense South American jungles in search for more, leading to many more explorations. Almost nothing was left of the Inca civilizations after the conquest by the Spanish, as culture was not as significant as gold to the new conquerors. It is estimated that 500 billion dollars worth of gold and silver were shipped from the Americas using 2015 prices. A gold certificate issued by the Treasurer of the United states against an equal amount of gold bullion held by the Department of the Treasury. The bills were intended for transactions between Federal Reserve Banks and no examples were ever put into public circulation. Technically it is still legal tender but only a few exist in the hands of government. Private ownership of a legitimate bill is illegal. There are many instances of fallen empires, kings and dynasties throughout history. Usually the lack of, or careless use of gold and silver play a major, if not complete role in the eventual collapse. Reserve currencies come and go. International currencies in the past have included the Greek drachma, the Roman denarius, the Byzantine solidus, Islamic dinar of the middle-ages, the Venetian ducato during the Renaissance, the 17th century Dutch guilder, and more recently, The French franc during the Revolution and Napoleonic wars, then the British pound. By 1922 the British Empire ruled over 450 million people, which was one-fifth of the world’s population and a quarter of the total land area at the time. By the Second World War, the British Empire was practically bankrupt. 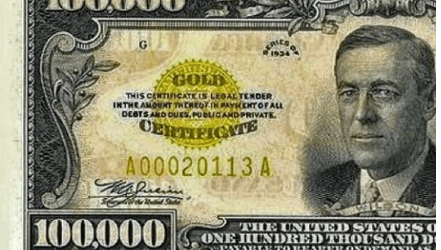 The US provided funding to Britain at the time, however, it was only after the Bretton Woods Conference in 1945 that the US dollar would officially become the world reserve currency.